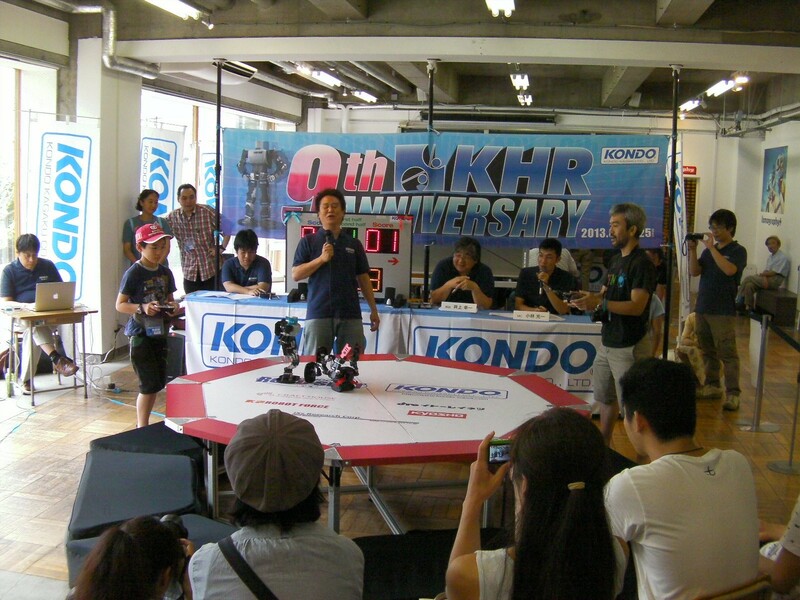 The 9th KHR Anniversary, Robot competition, sponsored by KONDO KAGAKU CO.,LTD took place at Arts Chiyoda in Tokyo on Aug 24 and 25th, 2013. The KONDO BATTLE KHR class took place on Aug 24th. The games were shown on `USTREAM KONDO-ROBOT Channel` from 1:00 pm to 4:30 pm (JST) and videos were keeping in the Channel. KHR-1, KHR-2HV, KHR-1HV and KHR-3HV can join the KHR class. Sixteen Robots joined were 2 KHR-1 based robots, 2 KHR-2HV based robots, 1 KHR-1HV robot and 9 KHR-3HV robots. The body regulation is the same as KONDO CUP KHR class. 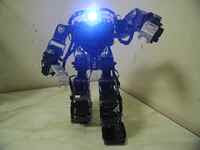 BLACK TIGER, my customized KHR-1 robot also joined the group B. Robots were divided into 4 groups. Preliminary league was carried out in each group. Final tournament was carried out with four robots, which were the 1st place robots of each group. The 1st place robot of A group was YutaRobo AT by Hiroshi N, B group was Cavalier by Emanon, C group was Banboo-custom by Battle-Banboo, Cochromkid by Kupapa. 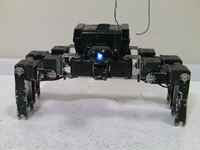 CoChromkid was customized robot based KHR-1 with KRS-788HVs, two KRS-4013HVs for legs and two KRS-6003HVs for arms.